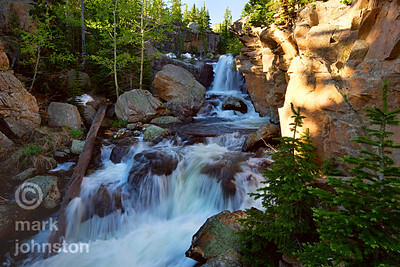 Scenes from Rocky Mountain National Park. 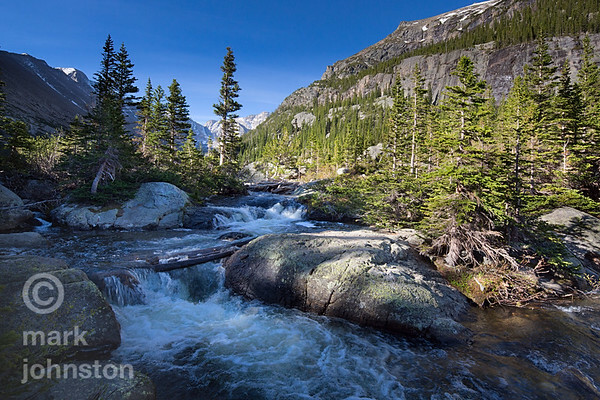 Glacier Creek descends through Glacier Gorge in Rocky Mountain National Park. 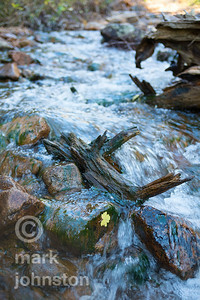 It's late September in Rocky Mountain National Park, and a Sycamore leaf clings to the side of rock in the upper reaches of the Big Thompson River in Rocky Mountain National Park. 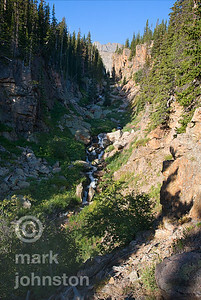 Just before sunrise looking down Hidden Valley Creek from near Trail Ridge Road. 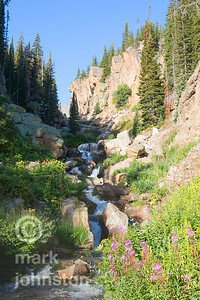 Sping snow melt brings life to the wildflowers along Hidden Valley Creek. 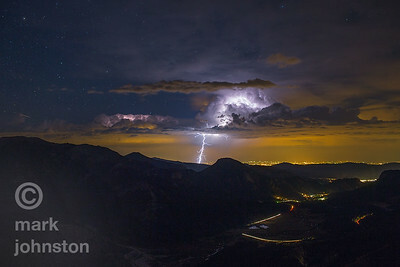 A lightning bolt illuminates the clouds over the Loveland, Colorado area. 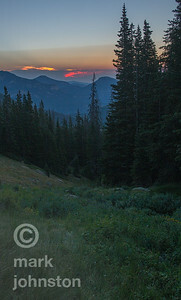 View from Rainbow Curve on Trail Ridge Road in Rocky Mountain National Park. 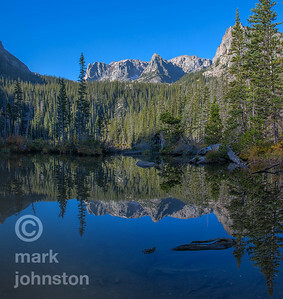 A peaceful morning at Fern Lake, with Little Matterhorn just right of center, and Notchtop Peak left of center, all reflected in the glassy smooth surface of the lake. 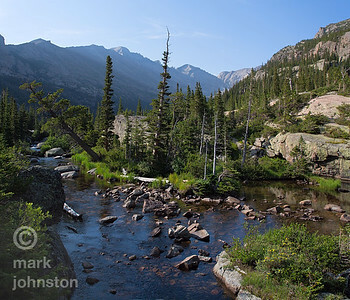 The approach to Odessa Lake from below along Fern Creek, with Notchtop Mountain at center, and Flattop Mountain to its left in the distance. 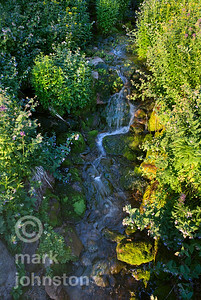 Glacier Creek descends from its sources a few miles further up Glacier Gorge. 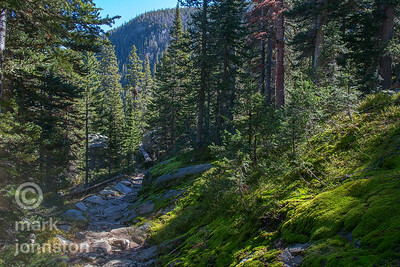 Looking down the Fern Lake Trail between Two Rivers Lake and Fern Lake. 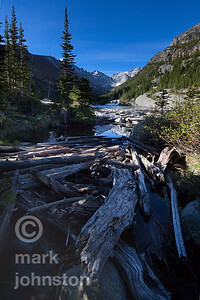 The approach to Mills Lake along Glacier Creek on the Glacier Gorge Trail. The fluted peak of Pagoda Mountain and the squared-off top of Long's Peak define the horizon at left. 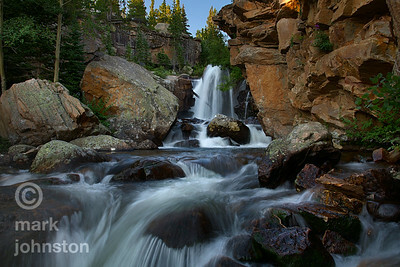 Glacier Creek drains Mills Lake in Glacier Gorge, Rocky Mountain National Park. 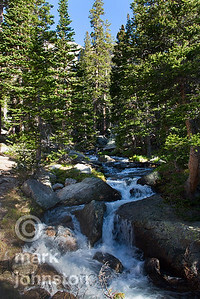 The sunlit top of Long's Peak is visible at left. 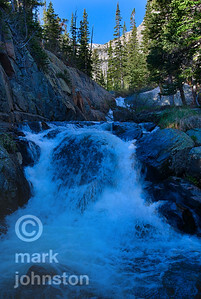 Hidden Valley Creek is fed by snow melt from above Trail Ridge Rd. 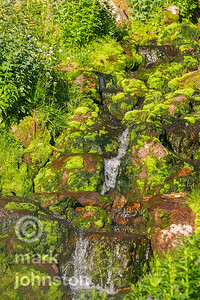 during the Spring and early Summer. The bottom of Lake Mills is jammed with the bleached trunks of trees washed down into Glacier Gorge. Pagoda Mountain lies at center in the distance, with Long's Peak to its left, and Chiefs Head Peak to its right. 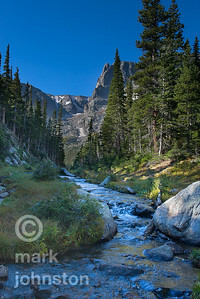 Glacier Creek runs through Glacier Gorge in Rocky Mountain National Park. 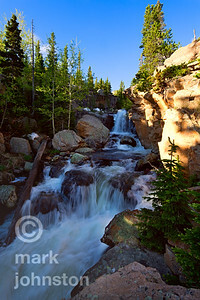 Glacier Creek runs through Glacier Gorge just below The Loch, Rocky Mountain National Park. 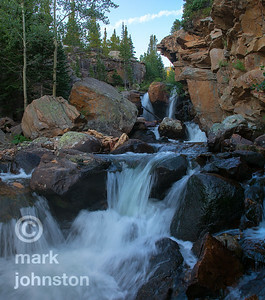 Glacier Creek drains Glacier Gorge and is a tributary of the Big Thompson River that flows into the South Platte River. 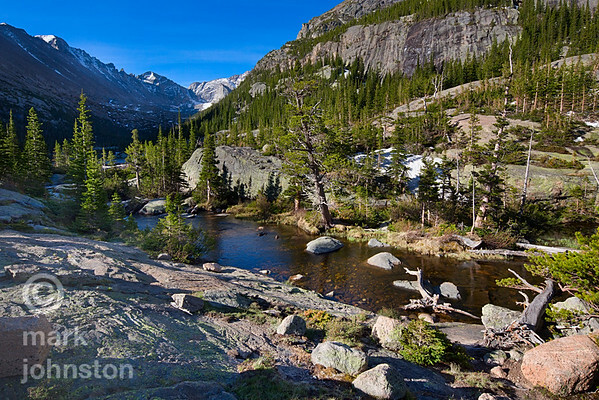 The sunlit summits of Long's Peak, Pagoda Mountain, and chief's Head Peak lie on the distant horizon.